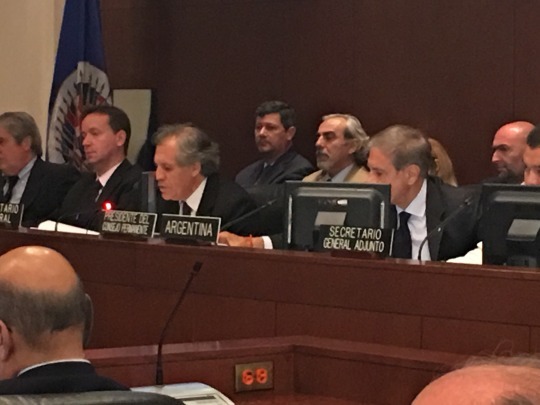 Today, the Permanent Council of the Organization of American States (OAS) is set to begin an important meeting over the situation in the country. The debate holds important ramifications not only for the Venezuelan government and the opposition, but also for the hemisphere’s collective response to the situation. WOLA will be liveblogging the situation directly from the OAS floor, and you can watch a live webcast of the session here. Some Closing Reflections: Clearly, the OAS session today was less exciting than some were expecting. After four hours of debate, the OAS ambassador from Argentina, Juan José Alcurri, who holds the rotating presidency of the Permanent Council, adjourned the session. There was no vote over the application of the Democratic Charter to Venezuela. On one hand, this was largely predictable. 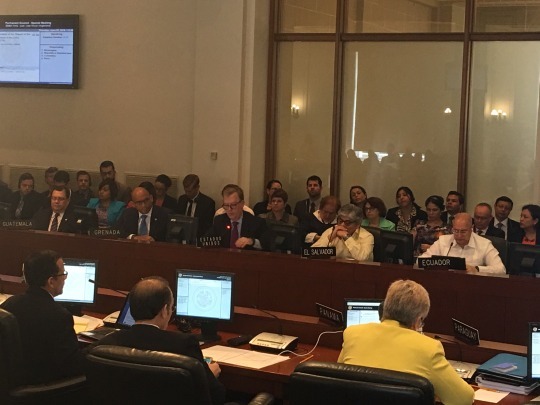 At the OAS General Assembly last week, 15 countries issued an outside statement calling on Venezuela to follow its own constitution, condemn violence, and support the UNASUR dialogue process. The fact that this statement was issued on the side, rather than introduced to the General Assembly, suggests these countries didn’t think they would get enough support in the OAS for such a resolution. The lack of a vote today would appear to back this up. On the other hand, it is significant that Venezuela’s efforts to alter the agenda and prevent Almagro from presenting his report were defeated by a vote of 20 countries. This suggests that, even if some member states were not fully supportive of Almagro’s efforts, most countries in the hemisphere are willing to recognize the gravity of the situation in Venezuela. 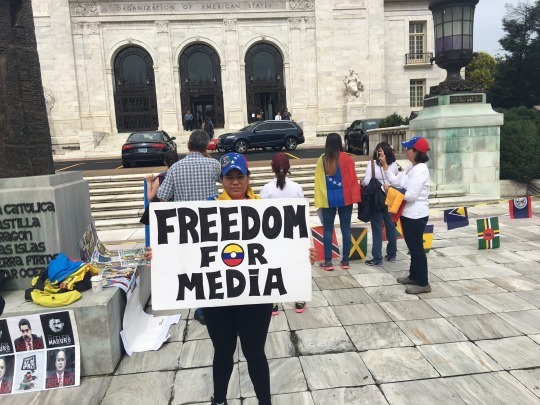 It’s also worth mentioning that this was not the only interesting meeting at the OAS today on Venezuela. Prior to the Permanent Council session, Almagro held a private meeting with opposition National Assembly President Henry Ramos Allup, in which they discussed the situation in the country and posed for a photo op. Although Ramos did not get to speak before the Permanent Council as he initially intended, the meeting with Almagro took place over the loud objections of the Venezuelan government (in both the foreign minister’s remarks in today’s session and Maduro’s statements in the lead-up to the meeting). Moving forward it remains to be seen whether, now that the debate over Venezuela and the Democratic Charter appears tabled, the UNASUR dialogue process will move forward. Of course, there are some serious roadblocks in this process, and it is unclear what kind of progress both sides are willing to make (see below). 1:46 Today’s session has drawn to a close, without a resolution on the application of the Democratic Charter to Venezuela and without any announcement of a follow-up meeting. It is important to note, though, that the many member states that spoke (including some who opposed the debate over the Democratic Charter) spoke in favor of continued dialogue between the government and the opposition. One venue for this dialogue is the UNASUR-sponsored process being facilitated by the three ex-leaders of Spain, the Dominican Republic, and Panama. So far, though, this process has been rocky. The opposition postponed an early June meeting with the UNASUR team. The Venezuelan government, meanwhile, has voiced support for dialogue. However, it is unclear what an agenda for this dialogue would look like. Maduro has opposed opposition demands like receiving offers of international aid to address economic scarcity, holding a recall referendum in 2016, and freeing individuals the opposition considers political prisoners. 1:22 One thing that has been lost in recent coverage of the OAS debate is the fact that no one, not even Secretary General Almagro, is actively advocating for Venezuela’s suspension from the OAS under the terms of the OAS Democratic Charter. This would require a two-thirds vote (24 votes) in today’s meeting, which would then trigger a General Assembly in which the region’s foreign ministers would have to vote again for Venezuela’s suspension by a two-thirds margin. It is unlikely that there is regional interest in pursuing this. 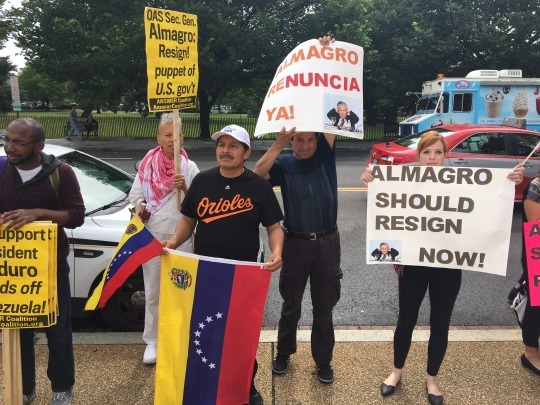 However, there is a chance that a simple majority of the OAS (18 votes) could support a resolution endorsing existing efforts to promote dialogue between the government and the opposition. A likely venue for this dialogue would involve a separate organization: the Union of South American States (UNASUR). UNASUR has sponsored efforts to organize talks facilitated by the former heads of state of Spain, the Dominican Republic, and Panama. Former Spanish Prime Minister José Luis Rodríguez Zapatero spoke before the OAS on Tuesday at the invitation of the regional body. 12:44 The United States OAS representative, Mike Fitzpatrick, is speaking now. He began his remarks on the debate with a statement of support for Almagro’s report and the move to hold a collective assessment over the situation in Venezuela. The United States, according to Fitzpatrick, supports “many” of the recommendations in the report, including a “timely” recall referendum in the country. He also supported the ongoing efforts at promoting dialogue being conducted by three ex-presidents under the auspices of UNASUR, and described today’s session as a potential avenue of support for this initiative. 12:37 As each OAS member state explains their votes, nearly every single delegate has taken time to congratulate Colombia for today’s historic announcement of a bilateral ceasefire between the government and the Revolutionary Armed Forces of Colomia (FARC). You can watch the signing ceremony here. 12:22 The breakdown in votes among OAS member states reflects familiar divides in the hemisphere. In general, those nations opposed to debating Almagro’s report and the application of the Democratic Charter were Venezuela’s ALBA allies and Caribbean countries: Nicaragua, Saint Kitts and Nevis, Haiti, El Salvador, Ecuador, the Dominican Republic, Bolivia, Antigua and Barbados, Dominica, and St. Vincent and the Grenadines joined Venezuela. The countries that voted in favor of moving forward with today’s debate were: Uruguay, Suriname, Peru, Paraguay, Panama, Mexico, Jamaica, Honduras, Guatemala, the United States, Costa Rica, Colombia, Chile, Canada, Brazil, Belize, Barbados, the Bahamas, Argentina and Guyana. The two countries abstaining were Saint Lucia and Trinidad and Tobago. 11:23 Almagro ends his presentation, and the floor is opened to OAS members to respond. 11:05 Almagro cites a recent assessment from Simón Bolívar University –cited in the New York Times recently– that found 87 percent of Venezuelans say they do not have money to buy enough food. 10:52 OAS Secretary General Almagro begins to present his report, which describes the economic, political and humanitarian situation in the country. He notes that Venezuela is confronting rising unemployment, increasing scarcity, and runaway inflation. 10:48 20 Yes votes, 12 No votes, and 2 Absentions, meaning that the day’s agenda will stand, and Almagro will proceed to present his report. 10:40 There is some confusion from the OAS ambassadors over exactly what the vote is on. With clarification from the chairman, the vote is proceeding. 10:28 The session begins with remarks by Venezuela’s Foreign Minister Delcy Rodriguez, who denounces a “coup“ within the OAS, and calls on the Permanent Council to reject the agenda for the day, which includes a review of Almagro’s 114-page report, in which he laid out his arguments for invoking Article 20 of the Democratic Charter. The motion is backed by the representatives of Bolivia and Nicaragua.